Reconstruction of the Outbuildings for Saddlery Workshop and Guest House: "At the Saddler’s"
The project is located in Lovech province (Bulgaria) and concerns the reconstruction of the outbuildings of a saddlery workshop and guest house. It aims to improve both the viability of the business as well as the tourism of the area. The Lovech province, located in the central Bulgarian mountains, is characterised by valuable natural resources and beautiful landscape. The region is also rich of cultural sites, such as monasteries and museums; has a strong tradition on agricultural and handcraft production and a well-developed transport and communication infrastructure. 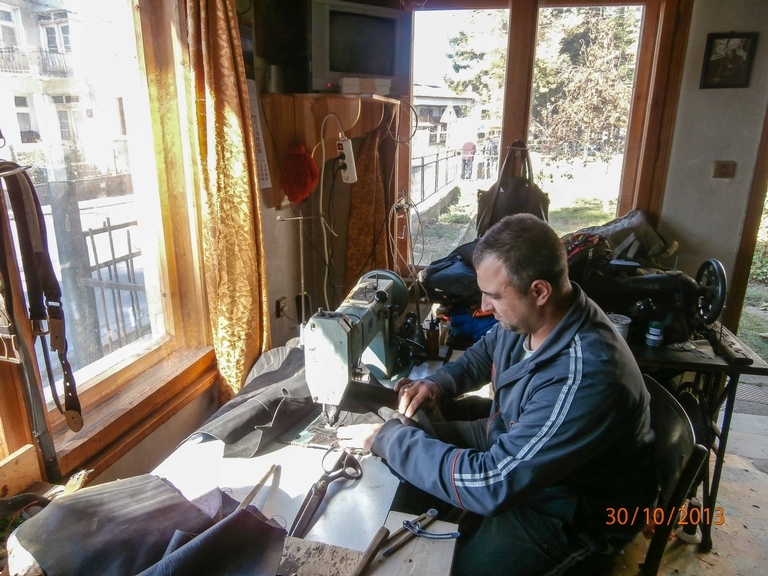 Hristo Hristov, specialised in manufacturing leather and particularly saddlery products, with the support of LAG Troyan – Apriltsy, decided to implement this project to further develop his business and contribute to the general development of the area. Specific objectives of the project are to: a) increase production and sales of saddler products and b) increase the business viability by adding the workshop space, the guest house and the offer of additional recreational activities. General objectives of the project are to: a) develop further the tourism potential of the area, by diversifying the tourist services offered; b) contribute to preserving local craft traditions; and c) increase the availability of accommodation facilities. The main activities implemented within the project are: building a guest house in Apriltsy; renovating a building to be used as workshop for saddler craft products; purchasing of the equipment needed to furnish both the guest house and the workshop. The small guest house ‘At the Saddler’ is built and equipped, it can host up to 4 people. It offers also a barbecue facility and horseback tours. The craft workshop will be used to organise exhibitions of the craft products and to demonstrate how the products are made, giving tourists the possibility to practice. These activities are expected to lead to an increased production and sales as well as help to promote local traditions. The project is also expected to create new jobs. Integration among different activities and different sectors is considered an important condition to promote the project viability in the long term.